"My name is Gabriel. I am not human, I am an angel." - Gabriel (Nand Buyl) in the short film Gabriel. 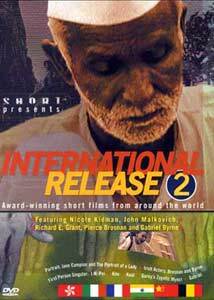 This volume of Quickband's Short: International compiles some interesting piecesof international filmmaking an subjects together under five section headings. Directed by Alina Hiu-Fan Chau. Presented at about 1:85:1, this animated short is an impressive combination of 3-D render workcombined with cel-shading and other effects. It creates the illusion of being hand drawn when actually a series of computer techniques were used to create it. Although only 3 minuteslong, it took 7 months to produce, which is not surprising given the level of detail. The film isaccompanied with a commentary by Chinese creator/director Alina Hiu-Fan Chau, a shortanimatic of one of the 3-D ships, and a composition test that shows a shot from the film in itsvarious phases of rendering. This is a 6 minute bio of the musical group Gorky's Zygotic Mynci, from Wales. It also featuressome clips of their music mixed in with the interview material. The band gained an extremelyweird reputation in England, despite the fact their music isn't particularly bizarre. According theproduction notes, they now have found a home on Beggar's Banquet records. At a combined 9 minutes, this is a series of interview snippets with actors Pierce Brosnan andGabriel Byrne (both filmed separately). While they are very candid, honest interviews, the editingcuts them way too short, and there's no way to watch all the snippets at once. The mostinteresting aspect of the interviews is the revelation of the fact that Irish actors face such toughodds, mostly being forced to play non-Irish people, especially Gabriel Byrne. Directed by Natasha de Betak. This 14 minute short film is presented just under full frame (about 1:40:1).It tells the fictional story of an Indian cobbler in Bombay (though the cobbler in the film is a realperson living in Bombay). While interesting and very well filmed, the text and dialogue is in anIndian language (presumably Hindu) with no subtitles. The director's commentary is included. The true gem of the disc is this 12 minute short, filmed in Belgium, presented in 2:35:1 (35millimeter). It tells the story of a young boy, Gabriel, who is being raised by nuns in a convent. He thinks he's an angel and that the nuns are supposed to help him grow wings. Gabrieluses a sepia-toned black-and-white film that brings a very rich tone to the visuals. Directed by Peter Long and Kate Ellis. This is the full length, 53 minute documentary about director Jane Campion and her making of thefilm The Portrait Of A Lady. While interesting and very well made (other than somepoor quality visual content), it would seem more appropriate as an extra on a DVD ofPortrait than just as a stand alone short here. This is a 4 minute excerpt from a much longer documentary about Chinese architect Ieoh MingPei that originally aired on PBS. One of his most famous buildings is the amazing Bank of ChinaTower near Hong Kong harbor, as seen in countless Hong Kong crime thrillers. One of thelargest buildings in the world, it also supports an amazing architectural system in which nocolumns are actually within the interior of the building. While all of this material is pretty good, it does seem a bit light considering the Shortdiscs are supposed to focus on short films. Regardless, there's some interesting stuff here thatgoes a bit beyond the usual short film DVD compilation. Image Transfer Review: While each piece adheres to the original aspect ratio, there are a few visual problems withcompression artifacts and pixelization. The best looking piece is Kite, but everything elsehas heavy grain and slight color bleed problems. My immediate thought was that these films weretransferred from a video print, which is probably why everything looks like tape. Nothing isruined, but the quality could have been better. Audio Transfer Review: Near all of the shorts come with a Dolby 2.0 Surround mix. Most shorts are Mono, but Gorky's ZygoticMynci has a much more vibrant surround track. The audio does its job, but isn't anythingspecial or amazing. Everything is clear and crisp, and the only weird thing I encountered was asound dropout during the end credits of Kite. Extras Review: As previously mentioned, a few of the shorts contain commentaries and additional information. Every piece has, at least, a production notes section with some details about the film's origins. Otherwise, there's little else on the disc except credits and 2 trailers for Warner Bros. releases of'Round Midnight and Clint Eastwood's Bird (oddly enough, both jazz movies). The presentation is nice, though, with some of the best menus I've seen on a Quickband disc to date. Though a bit light on substance in my opinion, this is still a decent disc for some exposure toobscure, foreign work. I'd recommend a rental.